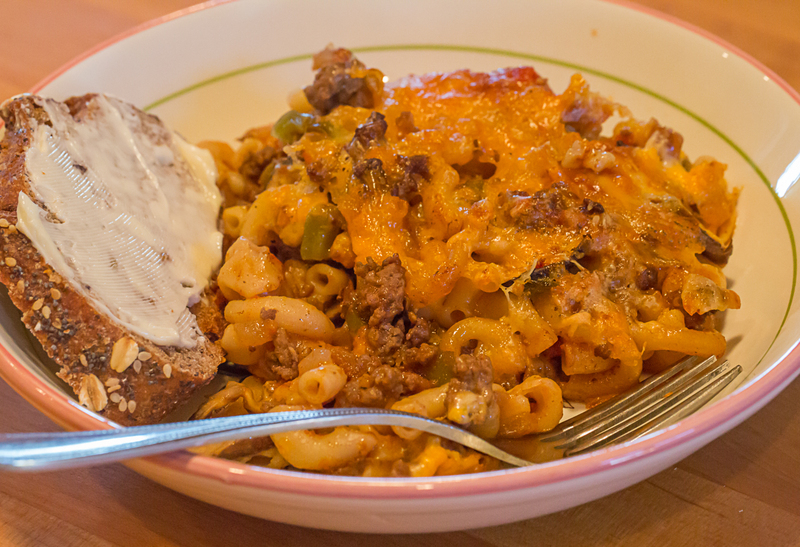 A few of my recent posts have dealt with pasta and casseroles, especially those I remember from my childhood. Here is yet another: my mother’s famous (or infamous as you will see) goulash, which was decidedly not the Hungarian variety. It was one of her most prized recipes, and a dish that family visitors often requested. She would bring it to the table with great pride, always in an oven casserole. When we had visitors, it would disappear before the meal was over, no matter how much she made. Sometime around my parents’ 25th wedding anniversary, the topic of Mom’s famous goulash came up at the dinner table, and my father – for whatever reason – made the offhanded comment that, actually, he never much cared for my mother’s goulash. A pall fell over the gathering, everyone ate quickly, and plates were rushed to the sink without much more comment. My mother never made her goulash again. Too bad, because it is really a quick, easy, and tasty one-dish meal for a family dinner. When I was compiling a family cookbook years ago, I asked my mother for the recipe. She didn’t send it even with a lot of cajoling. She even claimed that she had lost it. Finally, I received a copy just before she died. Actually, you don’t need a recipe, just a little imagination. Cook the macaroni in a large pot of salted, boiling water until just al dente (about 12 minutes at sea level, longer at higher altitudes). Drain and set aside. 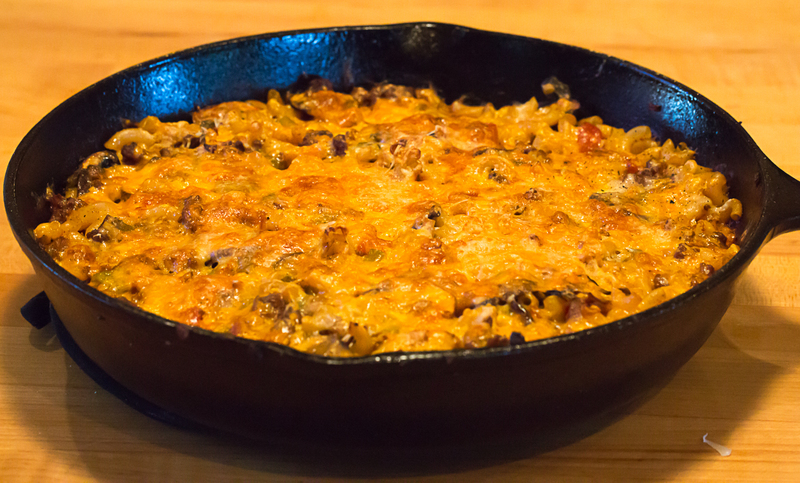 In a large oven-proof container (a large, heavy cast iron skillet works best), heat the oil on the stove over medium heat. Add the onions and sweat them until they are translucent and soft. Then add the celery, bell pepper, and garlic. Continue to cook, stirring frequently, until the vegetables are soft and well cooked. Add the ground beef. Stir frequently to break apart any lumps of uncooked meat. Continue to cook until the meat is well-browned. Then stir in the paprika, bay leaf, and thyme. Correct the seasoning with salt and pepper. Add the sliced mushrooms and stir until they are lightly cooked. Sprinkle the top of the casserole with the remaining cheese, dot with butter, and bake in the middle of an oven pre-heated to 350°F for about 40 minutes or until the cheese topping is melted and bubbling a bit. Serve immediately at the table with a salad and crispy bread. I have been away from my computer for several weeks doing a lot of traveling. Part of that was spent in a cruise around the Mediterranean beginning in Barcelona, Spain. This post describes our visit along with a couple of recipes for food we enjoyed while we were in this beautiful and exciting city. 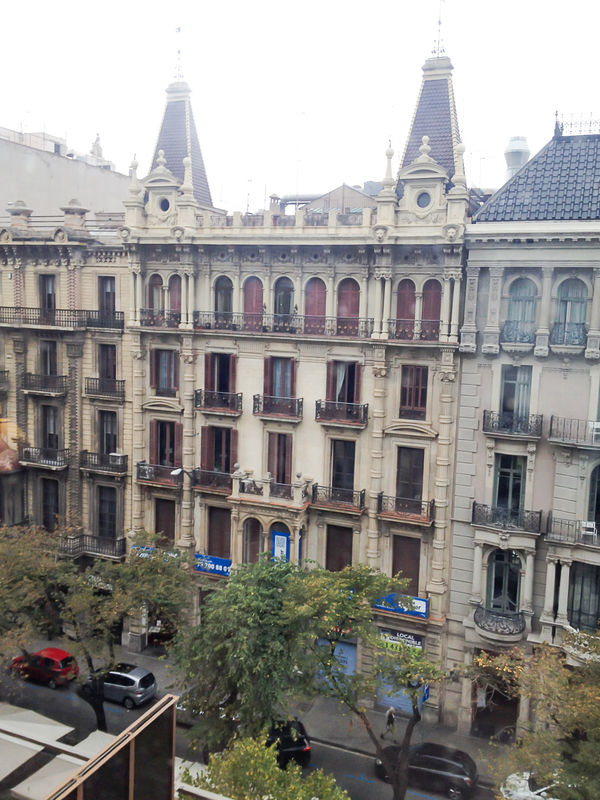 We arrived on a flight from Philadelphia and were taken to our hotel on La Rambla Catalanya. First on the agenda was a brief nap, and then we explored Las Ramblas and parts of the old city. The street was perfect for walking, with a wide pedestrian walkway shaded by beautiful old plane trees. All along the way, there were open-air cafés offering a wide variety of food and drink. We selected a brightly lit cafe with linen tablecloths not too far from our hotel. 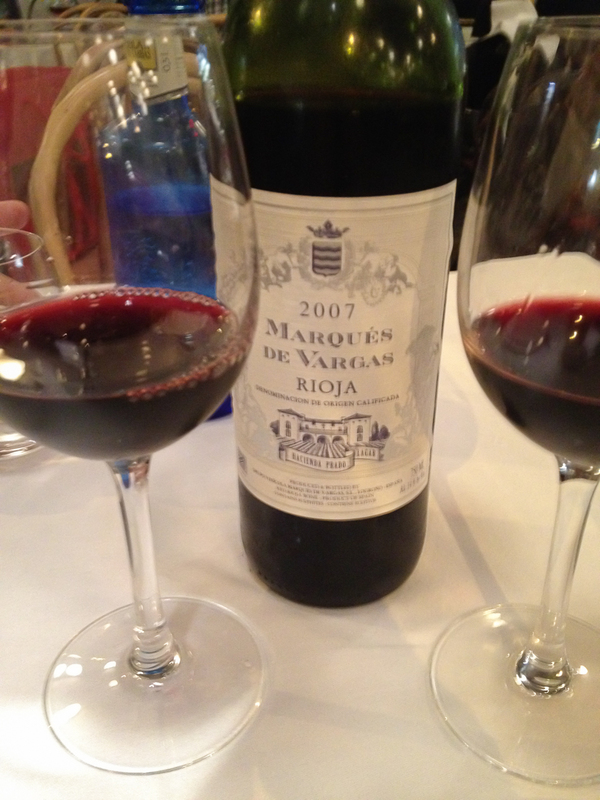 The waiters were extremely friendly, and the menu offered a wide choice of tapas, along with paella, sangria, and excellent Spanish and Portuguese wines. We settled on a short list of hot and cold tapas which included octopus, cod-fish croquettes, tomato bread, and other tasty items. One of our favorites was patatas bravas, highly recommended by our daughter, Sarah, who had spent a couple of summers in Spain. It turned out to be a great choice. The next day we toured the city including, of course, La Familia Sagrada. 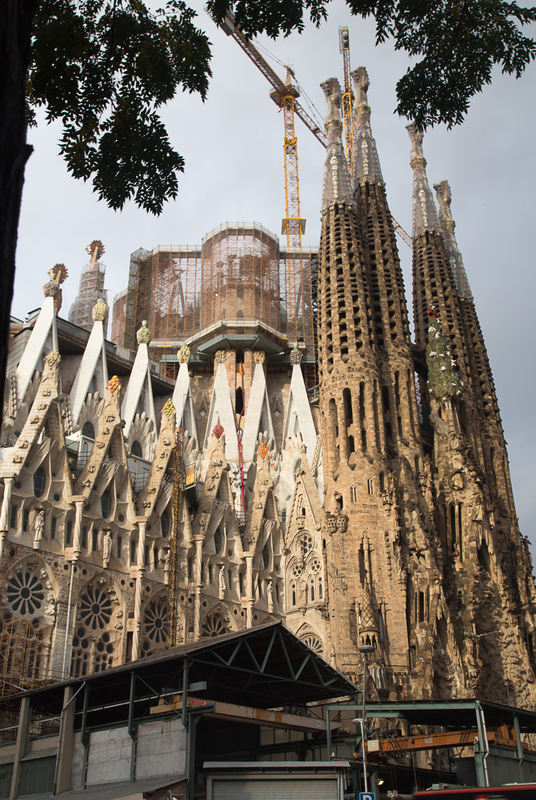 Even for those who have visited many times, no trip to Barcelona is complete without a visit to this spectacular church, under construction for 130 years with more construction projected to at least 2026. To me, it is hard to call the basilica beautiful – it flies too far outside my concepts of graceful architecture. At the same time, it is impossible not to think of it as an architectural marvel. The architect, Antonio Gaudi, began what would be his life’s ultimate work in 1883. Gaudi was obviously a genius who developed radical theories of construction based upon his observations of suspended strings and other seemingly simple yet profound understandings of geometry. The basilica is under very active construction with several huge cranes arranged around the perimeter, building more towers to bring the final total to thirteen or possibly eighteen, depending upon whether the full plan will be fulfilled. 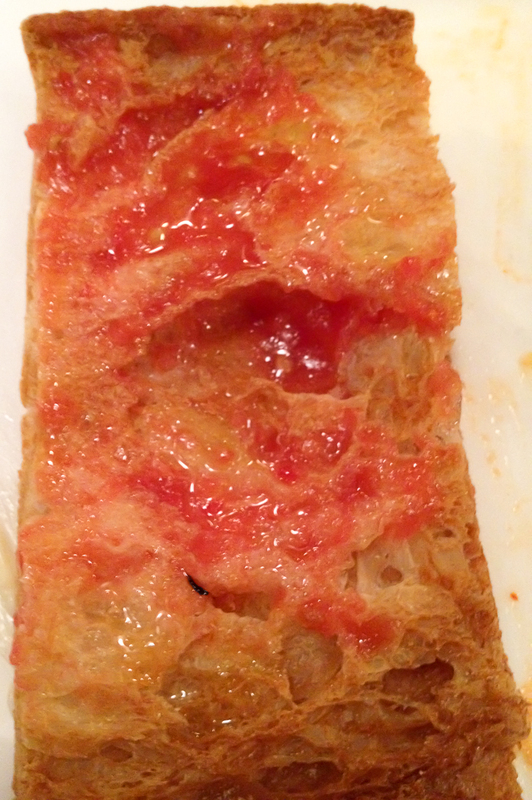 This is one of the most famous and popular of all tapas. As a result, there are many recipes for preparing the potatoes. You can choose to roast them, bake them, boil and fry them, deep fry them at two different temperatures, etc., etc. Probably the simples – and perhaps even the most authentic – is to roast them in the oven. 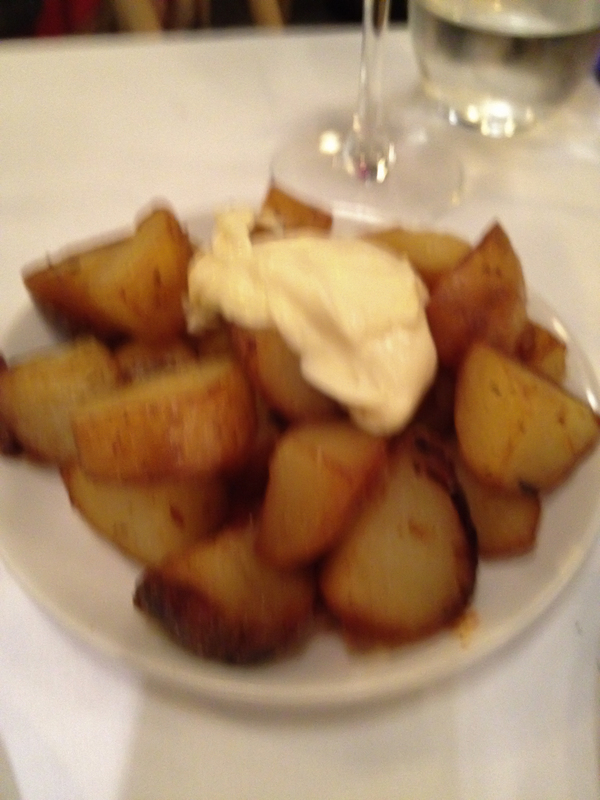 There is also variation in what to serve with the potatoes. A tomato sauce is common, but aioli is also common. You may even want to offer both, or your own choice of sauce. Heat the olive oil in a small saucepan over medium heat. Add the onion, sweat and then saute lightly. Add the remaining ingredients, cover and cook over low heat for 30 minutes. Cool, strain, and dilute with water if needed to make a moderately thick sauce. Using a whisk and a medium bowl, beat the egg yolks until smooth, thickened, and slightly foamy. By drops at first, whisk in the olive oil, until it is fully incorporated into the yolks before adding more. As the process continues, you can speed up the addition of oil. Do not rush the process or the sauce will separate. When the oil has been fully incorporated, whisk in the mustard and garlic-salt mixture. Then stir in the lemon juice to make a smooth sauce. Arrange the potato chunks on a small baking sheet which has been lightly coated with some of the olive oil. Drizzle the remaining oil over the potatoes and ststir just enough to coat the potatoes, keeping them in one layer. Roast in the middle of an oven preheated to 375° F for about 45 minutes. Stir several times during the roasting. Remove from the oven when the potatoes are well-browned and crisped. Sprinkle with the salt, pepper, red pepper flakes, and parsley. Serve immediately while still warm, along with the tomato sauce and/or alioli for dipping or spooning over the top. This is only one in a family of creamy desserts, including baked custard, flan, crème brûlée, and créme anglaise. They all have eggs, sugar, and milk or cream. Sometimes they have corn starch or gelatin as a thickening agent. Some are baked in a water vath while some are cooked on the stove top. The more you read recipes to discern the differences, the more confusing the relationships. 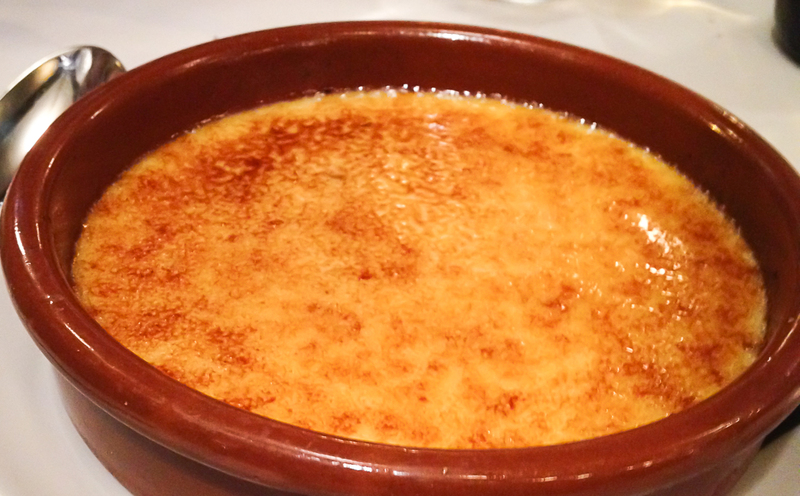 Whatever, crema catalana is traditionally cooked on the stove, allowed to set up in the refrigerator,and served in a shallow terra-cotta dish, topped with sugar caramelized with a salamander, under a broiler, or with a blow torch. Stir constantly until the mixture thickens. Work slowly or you will scramble the eggs. When the mixture has thickened enough to lightly coat your stirring spoon, remove immediately from the heat. Remove the cinnamon stick You can strain the custard at this point if you wish. Then ladle into 4 to 6 small ramekins or casuelas. Refrigerate at least 3 hours, and preferably overnight. When you are ready to serve, remove from the refrigerator, sprinkle about a tablespoon of sugar over the top of each of the individual servings. Caramelize the sugar topping by (1) using a small metal salamander heated on a stove burner, (2) running under your oven broiler for 5 to 10 minutes, or (3) using a small culinary blow torch.